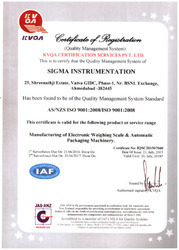 Established in the year 1996 we, “Sigma Instrumentation”, are an eminent manufacturer and supplier of an excellent range of Material Handling Systems and Packaging Machines. Our range of products is fabricated using supreme quality components and other material procured from some of the trusted sources. Moreover, the entire range of products is designed, manufactured and packed with the aid of sophisticated machinery and latest technology. The products that are being offered by us are widely appreciated by the clients for their durable standards, rugged construction, corrosion resistance finish and efficient functioning. We make sure to offer these products in standard as well as customized forms to meet the exact demands of different industries and sectors in an efficient manner. We have been backed by a team of skilled experts, which conducts market research to improve ourselves with the passage of time. They keep themselves updated about the knowledge and technical advancements related to our fabrication processes and equipment. 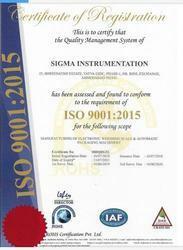 With their support, we have been able to offer products that conform with global quality specifications. Moreover, they deliver quality modulation services to the clients. Our organization focuses on attaining complete customer satisfaction. The products range is highly demanded all across Indian Subcontinent, South/West Africa, East Asia, Middle East and South East Asia. With the efficient leadership of our Managing Partner, 'Mr. Naresh Patel', we have been able to attain a distinctive position in this highly competitive industry. With his comprehensive technical talent and excellent management abilities, he provides the essential driving force to our organization to stay ahead of our competitors. Our range of products is customized as per the specifications mentioned relating to size, design etc by the customers. 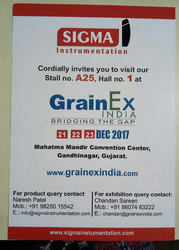 We are cordially invites you to visit our Stall no A25, Hall no 1 at GrainEx India. We are one of the prominent manufacturers and suppliers of a quality-assured range of Material Handling Systems and Packaging Machines. These products are fabricated in compliance with the international quality standards, using high quality raw material & components. Moreover, we make sure to offer these products in varied capacities, grades and other specifications. Available in standard & customized forms, these products are widely demanded in the market for their durability, easy operations & maintenance, reliability and consistent performance. Our range of supreme quality Material Handling Systems and Packaging Machines is made available to the clients in varied specifications, in order to meet clients' different preferences. With the assistance of our team of experts and deep understanding of the industry, we have been able to offer products that can successfully meet the process requirements of various industries and sectors. We have become one of the preferred choices of the clients by the consistent hardwork of our professionals. Our team of professionals understands industrial requirements and makes sure to offer a high quality range of Material Handling Systems and Packaging Machines to the esteemed customers. The rich knowledge and experience of our professionals help us in fulfilling the market demand efficiently. Moreover, we organize in-house training sessions and seminars for keeping our workforce updated about the latest change in the product and technology. We have been able to offer an excellent range of Material Handling Systems and Packaging Machines in the market to meet varied requirements of the clients. Our organization is known to adopt client-centric approach and ethical business practices in all the business activities.